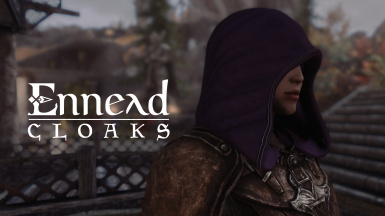 Cloaks and hoods created for my Ennead series of mods. Features 4K handpainted textures, crafting and Frostfall compatibility. Tarshana created the Frostfall compatibility, added crafting options, created the ESPs and tweaked the hood UVs. Ashara﻿ created the cloak and hood meshes. Leveled lists are now included and on a scripted quest event when you first load the ESP. The items are added to the clothing lists and will appear when the vendors restock. Radiant Raiment will have them stocked more often. Changed the crafting quantities to be correct. Hoods and cloaks with handcrafted textures by Mist, meshes by Ashara with upgrades and new features by Tarshana. Created with compatibility in mind for Frostfall. Uses slot 46. Supports most races and genders, excluding children. Beast race compatibility is WIP for the hoods, but works just fine for the races of men and mer. All new cloaks and hoods are craftable at any tanning rack with the Ennead Crafting Flute. Leveled lists are in the works, for now enjoy the crafting! Features custom color palettes and fabrics created to resemble the artistic style of Ennead banners. 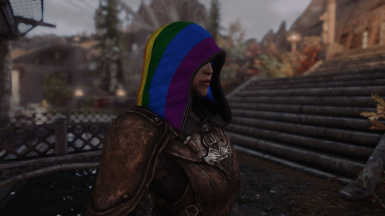 I recommend using 360 Walk Run Plus with these cloaks. 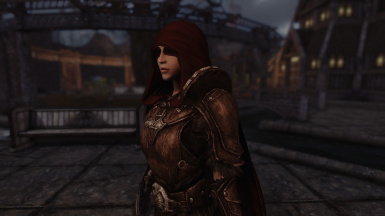 Download via manager or drop the BSA + ESP into your Skyrim Data folder. Select yes for all overwrite prompts. Ashara created the cloak and hood meshes.